Want a private backyard paradise and endless community amenities? 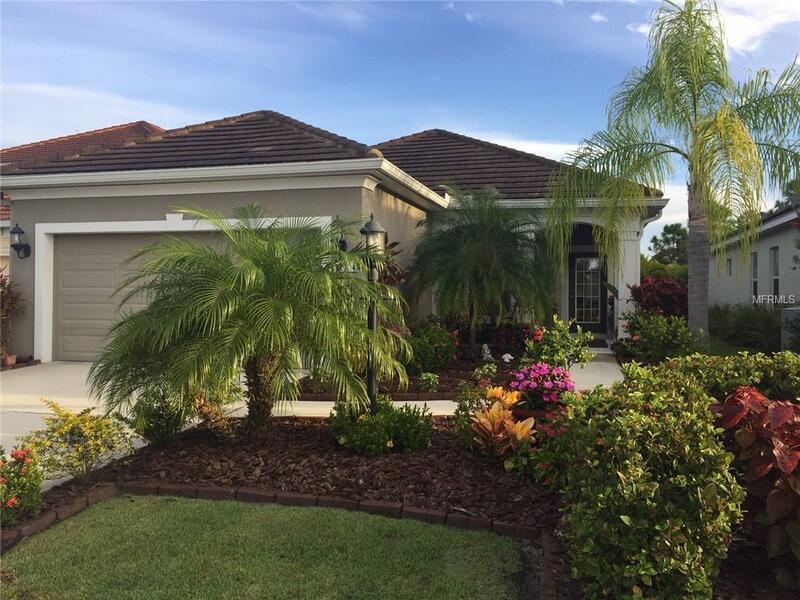 Enjoy the best of both worlds with this fantastic home in Grand Palm! Upgraded Liberty 2 model situated in a quiet cul-de-sac location. Backyard overlooks a beautiful, protected preserve. 33 x 28 screened lanai offers an incredible extended living and entertainment space. Dreamy 28 x 14 saltwater pool with Pebbletech lifetime surface, Hayward heater and fiberoptic multi-color changing light. 20 gauge screening means no bugs as you BBQ! Water fountain stays. Inside you'll find a well-appointed kitchen with wood cabinets and granite counters. Island and stools stay! Coffered ceiling in the Living Room. Nice-sized Master Suite has dual walk-in closets. Large tile throughout all living areas. Amazing landscaping with Fox Tail palms and colorful perennials - all easy to maintain with irrigation system. All-around gutters. Too many upgrades to list! Grand Palm is a gated community, conveniently located to the beach, I-75 and all Venice has to offer. With 28 miles of walking & biking trails, clubhouse, workout facility, 2 resort-style pools, basketball, sand volleyball, activities director, numerous lakes for fishing & kayaking, playgrounds, splash pad and 2 dog parks for your 4-legged friends. Low HOA fees! Come see all Grand Palm has to offer. Schedule your showing today! Additional Lease Restrictions Application And Fee Required Per Hoa Rules. See Hoa Docs. Listing provided courtesy of American Realty Of Venice, Inc.